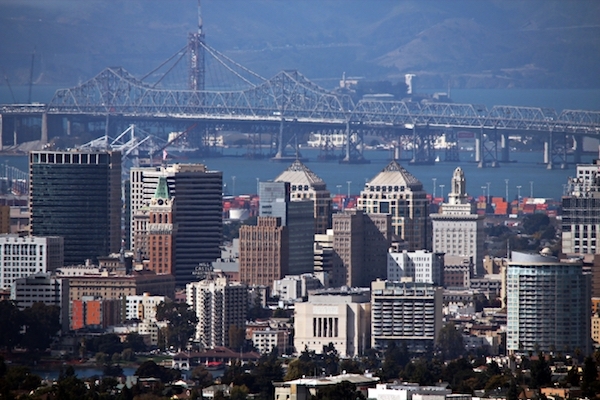 The Oakland City Council meeting ended in confusion and shouts of anger Tuesday night after a legal issue delayed a vote on an ordinance that would have extended rent control protections to tenants living in own-occupied duplexes and triplexes. “What’s the issue?” shouted attendee Reisa Jaffe at new Council President Rebecca Kaplan (at-large). “I’d like to know what happened?” demanded another atttendee, standing up with his hands in the air. “These issues were just brought to our attention tonight,” said Doryanna Moreno, Oakland’s chief assistant city attorney, who did not explain what the legal issue is, citing “confidentiality.” The issue was was substantial enough to delay a highly anticipated vote on a contentious rent protection ordinance. Councilmembers Dan Kalb (District 1) and Noel Gallo (District 5) proposed the legislation as a companion to Measure Y, which passed with more than 58 percent of the vote in November. The measure added just cause protections to tenants living in owner-occupied duplexes and triplexes, units that were previously exempt from such regulations. Now, landlords must have a good cause—for example, proof of a tenants’ unpaid rent or illegal activity—to evict them. The companion legislation presented to the council Tuesday night would add additional protections for tenants by applying the Rent Adjustment Ordinance (otherwise known as rent control) and the Tenant Protection Ordinance (which provides tenants legal options if they are harassed by their landlord) to duplexes and triplexes that house not only tenants, but the owner of the property. Under existing law, those properties are exempt from rent control and tenant protections. Kalb noted that it was always his plan to pass a companion ordinance to Measure Y to expand renter protections beyond the just cause ordinance. Kalb noted in a committee meeting last week that having just cause protections without rent control defeats the benefits of the measure, because without it, landlords don’t have to actually evict tenants—they can effectively do so through rent increases. Dozens of people signed up to speak on the issue. Tenants’ advocates in red t-shirts sat on the right side of the aisle, and landlords sat scattered throughout the chamber. Setting down her knitting, renter Diane Kaufman stood up to testify about her situation. In a quiet voice, she explained that she lives in a duplex and is currently paying $2,000 a month in rent. Without the proposed new ordinance, however, she is certain her rent will increase to market rate—which she believes will double her current bill. “That will be an eviction under another name,” said Kaufman, reading from a prepared speech. “This is one of these situations where you have to do the right thing,” said Leah Simon-Weisberg, the managing attorney of the Tenant Rights Program at Centro Legal de la Raza, a legal rights agency for low-income residents and immigrants. But Daniel Gonzalez, who owns a duplex in Fruitvale, argued that the ordinance is not “fair.” He said his mortgage is $2,600 per month. His tenant pays $800 a month. “I’m effectively paying to subsidize a tenant that—no offense to them—is effectively a stranger to me,” said Gonzalez, tearing up as he said that he is relying on this income to help his father retire. More than an hour later, Gonzalez’s tenants responded through an interpreter. Kenia Perez, a counselor for the tenants’ rights advocacy group Causa Justa, said that next month Gonzalez will be increasing the rent of his tenants, Arselia and Armando Perez, by 125 percent, from $800 per month to $1,800. The couple’s combined Supplemental Security Income (SSI) —government assistance for low-income seniors—is around $2,000, making the rent increase unsustainable, their interpreter said. “Sorry,” said Perez, pausing and struggling to continue to speak, before waving her arm in frustration. “It’s very infuriating that we all get the security of going back to our homes and having a place to sleep and these two folks don’t know what the future of their housing situation is.” Armando and Arselia Perez stood in silence behind their interpreter as she submitted the testimony. Halfway through the long list of public speakers, council president Kaplan interrupted the speakers. “We’re going to have a brief pause for a moment, because we have a request from our city attorney for an announcement,” she said. “We have been advised of some legal issues. We recommend the council put this on hold to its next council meeting so we have time to review the issues and advise the council,” said Moreno, the chief assistant attorney. The people in the room sat in silence for a moment, until a round of cheers erupted from the group of landlords who had congregated on one side of the chamber. “Don’t clap!” yelled someone in the crowd. It’s unclear who brought this issue to the council’s attention. Following the surprise announcement, public testimony continued. Many urged the council to not delay a vote because there are tenants, like the Perez family, who could soon lose their ability to afford their rent if protections are not enacted. Councilmembers Kalb and Nikki Bas (District 2) also expressed concerns on behalf of tenants. Bas suggested scheduling an emergency meeting to propose an ordinance to mitigate the effects on tenants while the city staff figures out the legal issue. Kaplan suggested bringing that issue up at Thursday’s rules committee meeting. For the time being, the council voted unanimously to continue the ordinance to their next full council meeting on February 26, in the event the council decides not to hold a special meeting in the meantime. While the meeting concluded on a frustrating note, it began with a much different atmosphere, as hundreds of teachers crowded city hall, filling the corridors, the chamber and galleries ahead of the council’s vote on a resolution supporting Oakland Unified School District (OUSD) teachers. Last week, Oakland teachers voted overwhelmingly to authorize a strike over concerns about wages and class sizes. The vote allows union leaders to call for a strike after February 15. OUSD teachers have been without a contract since 2017. As the clerk called the agenda item, dozens of teachers and their supportersfiled into council chambers for their turn to speak. A few carried white sheets of paper with notes about their remarks. Others held signs; although they didn’t intend to speak, they signed up in order to cede their time to others. Keith Brown, the president of the Oakland Education Association, the teachers’ union, spoke first, commending the council’s resolution. 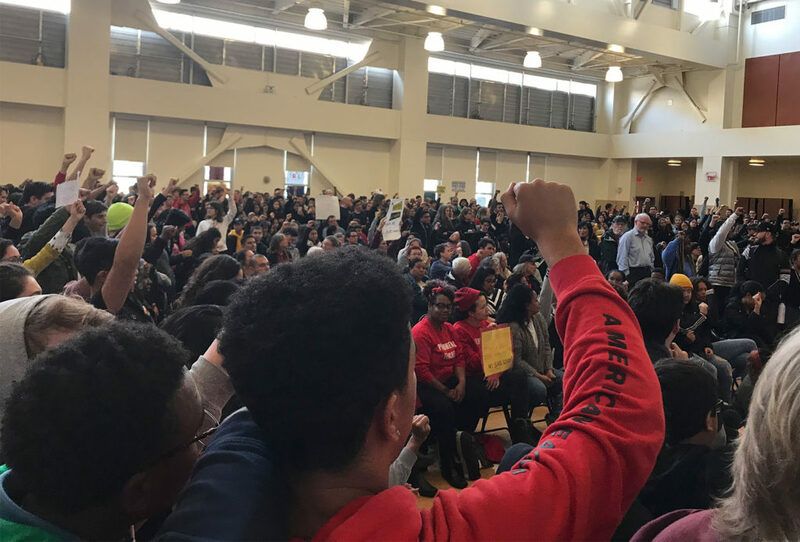 Surrounded by a crowd of teachers, union officials and other community advocates, Brown elicited cheers as he spoke about Oakland’s responsibility to its children. “This year we finally make out students a priority,” he said. “We need to come together for our schools as a community,” Brown continued. While the city council has no authority to address the negotiations between teachers and the school district, Brown said that the resolution could be helpful as the union works to avoid a strike. He said a resolution would not only show the district the vast community support for teachers, but give negotiators leverage to resolve the contract dispute. Former mayoral candidate Cat Brooks called upon the council to move their efforts from rhetoric to action. “It’s one thing to pass a resolution and to do that when the news folks are here. It’s another thing to use your weight and power and position to support our teachers and our parents,” said Brooks as the room exploded with applause. Jessica Villanueva, a teacher at Roots International Academy—a school the school board recently voted to close—looked directly at new city councilmember Loren Taylor, asking for his help to reverse the closure decision. Taylor represents District 6, where Roots is located. Taylor did not respond to the speaker’s request during the meeting. 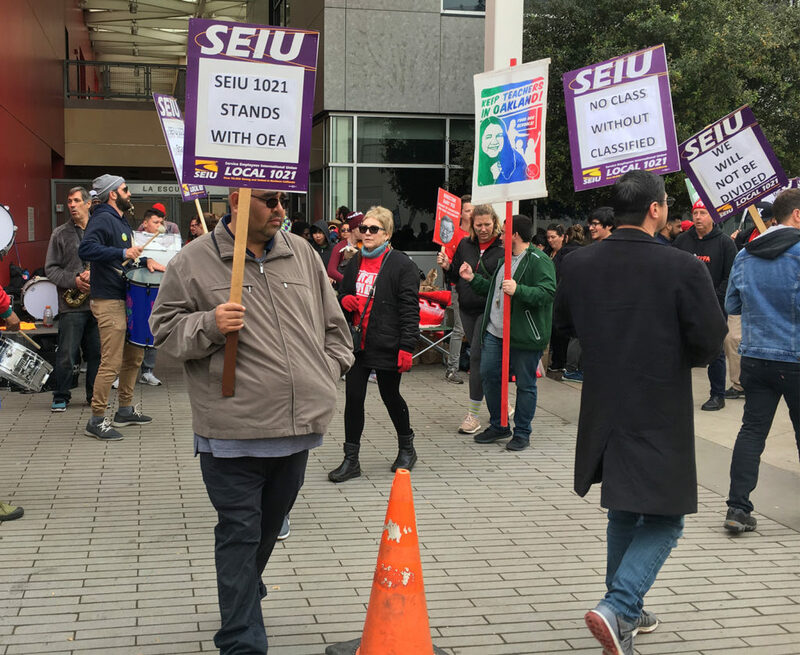 Ismael Armendariz, a former special education teacher, who is now the vice president of the Oakland Education Association, said the possible teacher strike is part of a “national movement to revitalize public education,” referring to the recent strike in Los Angeles. Prior to the vote, Councilmember Sheng Thao (District 4) said that “as the mother of an OUSD student is so imperative that we support our teachers that includes fair wages.” Councilmember Larry Reid (District 7) told the teachers he “heard them loud and clear” and noted that he plans to schedule a meeting with the president of the school board. OUSD Superintendent Kyla Johnson-Trammel reiterated last week in a letter to the public that the district does not want a strike. A neutral fact-finding panel is set to propose a possible compromise agreement on February. 15. If the district and union don’t find the terms agreeable, at that point, the teachers’ union can call for a strike. While the details aren’t yet finalized, according to Maraskeshia Smith, Oakland’s assistant city administrator, in the event that a strike happens and schools are closed, Oakland city officials are working with the school district to make sure libraries and recreation centers are available to students whose parents work during school hours.